This week marks three years since I started this blog, which means it's been three years of learning lessons the hard way (ALWAYS the hard way), three years of getting the side-eye from Judson on the weirder recipes even as he supports every dish I attempt to make, and three years of actively avoiding the recipes for swiss rolls sprinkled throughout the Recipe Box. But I've picked up a lot of skills in the last three years, and finally decided it was time to tackle a proper swiss roll in the style of a Victoria Sandwich. It was a 2018 goal of mine to learn to make a decent swiss roll, so in honour of the third anniversary of The Recipe Box Project, here we are! 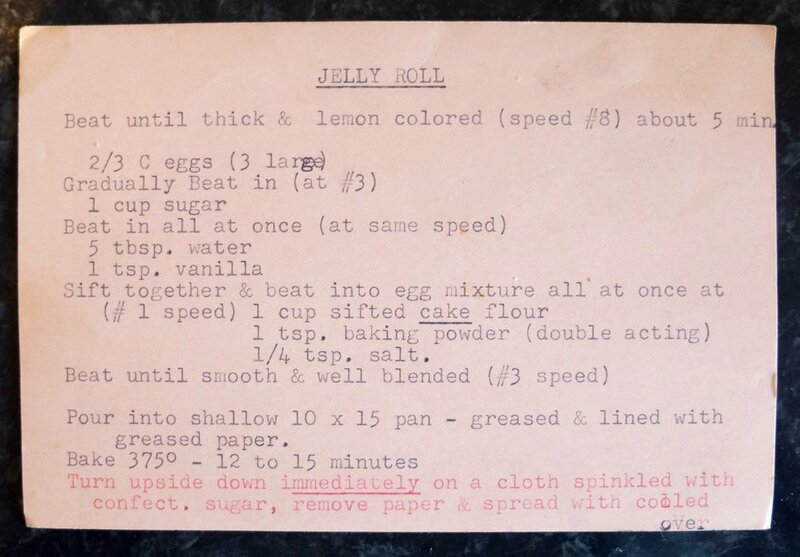 I still make a lot of American and Americanesque recipes these days; a solid chunk of recipes in the box are probably identifiably American, and in a pinch without other plans to the contrary, I'll probably always fall back on the recipes I grew up with. But I'm always trying to broaden my kitchen repertoire and become more experienced with British and especially Scottish dishes. 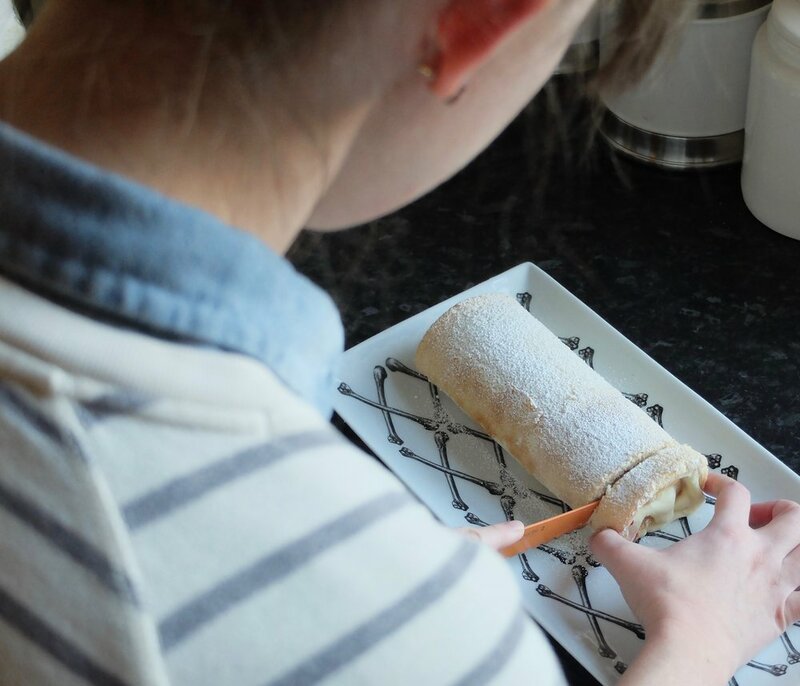 So to combine my roots with my adopted culture, here's a swiss roll made in the style of a Victoria Sandwich- the most quintessential of British desserts. Loads of tiny bubbles, so make sure you tap that batter before you cook it! See that filling oozing out? That's why you add extra powdered sugar if it's too thin! A Victoria Sandwich is made of two layers of vanilla cake sandwiched with a filling of jam and a simple buttercream or whipped cream, the whole thing dusted with powdered sugar. I hate a Victoria Sandwich because I am a baptised member of the Church of All Possible Frosting, but using the flavours of a Victoria Sandwich in a swiss roll means you get all the necessary flavours but at a ratio of ¾ cake to ¼ frosting (this is the holy ratio when it comes to cakes, as far as I am concerned). 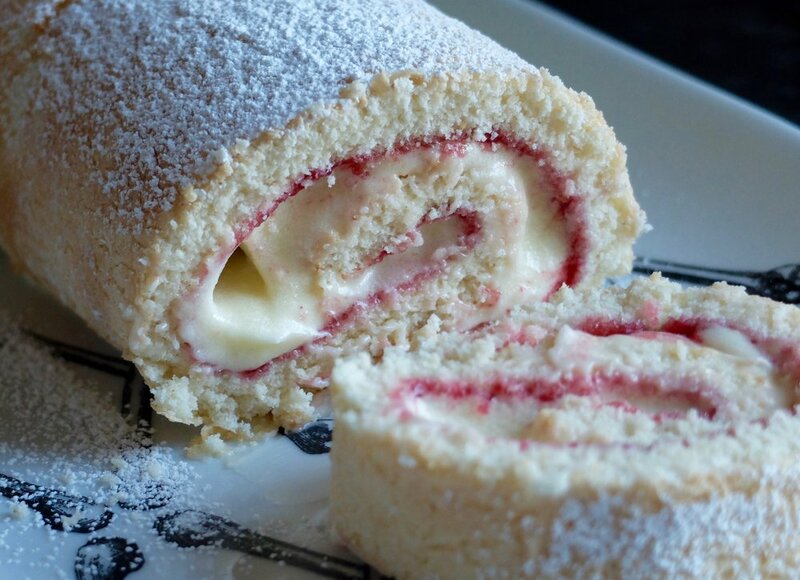 What I'm saying is: this swiss roll is the perfect cake. A combination of British flavour and American techniques, beautifully presentable to your pals, your colleagues or anyone you need to impress, and you don't have to pipe or smooth any frosting! Swiss rolls aren't really a thing in the US these days; before making this, I had never even had a swiss roll before, much less made one. I haven't quite perfected my own technique yet- if Mary Berry was invited over for tea, she'd point out that my swirl could be an awful lot tighter*- but I was still pretty stoked at how this one came out (a big improvement over the first time I tried to make one back in 2016... the whole thing fell apart into a pile of messy crumbs before I even got it out of the pan). Then a Scottish friend asked me what I've been cooking lately and I humble-bragged about how I had finally made a successful swiss roll and I guess she didn't realise that I was proud of it and had never made one before, so she rolled her eyes and told me a story about learning to make an amazing swiss roll way back when she was in primary school and how years later as a teenager, her home economics class was such a joke because they did nothing but make swiss rolls every day for weeks and it was the easiest class she's ever taken. A few words of advice: if there was ever a recipe worth getting your mise-en-place done before you even start, it's this one. Make sure you've read through the recipe and have your pan prepared, your oven preheated and your dishtowel set aside and ready to be used. This isn't a difficult cake to make (and your frosting doesn't have to look stellar! ), but you should be prepared for every step of the process before you begin or you'll end up with a cooled cake that won't roll properly. You can fill this cake with anything you want; a chocolate ganache with cherry jam would be amazing, or a citrusy fruit curd. I used raspberry jam and an almond-infused whipped cream cheese frosting to mimic a Victoria Sponge, and I have no regrets. *No she wouldn't, because Mary Berry is a gem of a person and would never be so rude. But Paul Hollywood totally would. 5 spoons out of five. Besides being delicious, this cake is versatile, beautiful, not too heavy and a perfect complement to afternoon tea, a birthday party, or your next dinner party. This version of cream cheese frosting makes a glaze, not a frosting, so I updated it below. Don't try to use this one! Grease a 10x15 shallow-sided pan, then line the bottom with greased parchment paper and set aside. Sift together cake flour, baking powder and salt, then set aside. On medium-high speed, beat eggs until thick and pale yellow (approx. 3 minutes). Lower speed to medium-low and gradually beat in sugar for approx. 1 minute. At same speed, add water and vanilla all at once. Beat in flour mixture all at once. At same speed, continue beating until very smooth and well-blended. Pour into prepared pan, then drop pan three times onto counter from a height of a few inches to knock out any air bubbles. Bake 11-13 minutes until just done. While cake is in the oven, lay a dishtowel on the counter and sprinkle with powdered sugar. Make sure powdered sugar is in a thin, even coat covering the entire dishtowel. AS SOON AS CAKE COMES OUT OF OVEN, run a knife around the edge of the pan, then turn out onto prepared dishtowel. Gently peel off parchment paper, then, using the dishtowel as leverage, quickly roll the entire cake into a spiral with the dishtowel, starting with the short end. Set aside and allow to cool while you make the filling. Beat butter and cream cheese until smooth and uniform. Add salt and almond or vanilla extract, then 3 cups of powdered sugar. Beat until smooth, then add ½ c (60g) powdered sugar at a time if needed to reach a soft but spreadable consistency. Once cake is mostly cool (at least 30 minutes, carefully unroll it from the dishtowel and spread with a thin layer of raspberry jam. On top of jam, spread or pipe cream cheese frosting in a thick layer. Starting from the same edge as before, gently but tightly roll the cake into a spiral. Rotate the cake so that the seam is down and place on a serving plate, then sift powdered sugar over the whole thing.